Fishing with natural bait is perhaps the most productive method of angling for saltwater game fish. Bait fish, clams, crustaceans, squid and other marine life all make good bait, depending on the game fish species. When you match the saltwater bait you use to the prey of the fish species you want to target, you greatly improve your chances of success. Saltwater bait fish such as menhaden, mullet, eels, herring, sardines, ballyhoo and pilchards all work well to catch saltwater game fish. According to the Take Me Fishing website, there are several ways to rig live bait fish. Try passing the hook either through the lips, nose, eye sockets for trolling or the base of the tail for freelining. Bait fish also work well as cut bait. Strips, fillets, sections or steaks of bait fish are very attractive to game fish such as snapper, grouper, cobia and tuna. Many anglers also add cut bait to artificial lures to add a level of scent attraction. Many saltwater game fish species, such as sheepshead and drum, feed almost exclusively on crustaceans. Fiddler or blue crabs, various species of shrimp, sand fleas, lobster and other crustaceans make excellent bait. Hook live crabs through the point in the side of the shell. Shrimp are easy to rig live with a hook through the tail. Anglers can also fish crustaceans dead, whole or in pieces. Mass Bay Guides indicates that sea worms are good bait for a range of game fish species, including striped bass, cod, pollock, flounder, fluke, halibut and mackerel. Sand worms, ragworms, lugworms and others are all available—live or preserved—at coastal bait shops. Live worms tend to work best for bait, either whole or as pieces. Shellfish, such as clams, mussels, welks and conchs, make good natural bait. Remove the meat from shellfish with heavy shells. For lighter-shelled species, simply crush the shell. Cut larger shellfish into smaller bite-sized chunks that saltwater game fish can handle. Then, slip the meat onto the hook and you are ready to fish. According the the Take Me Fishing website, squid and octopus are favored by many saltwater species, including croakers, sea bass, amberjack, dolphin and bluefish. Cut strips of squid or chunks of octopus for bait, or use small ones whole. These work well for trolling, bottom fishing and float fishing setups. 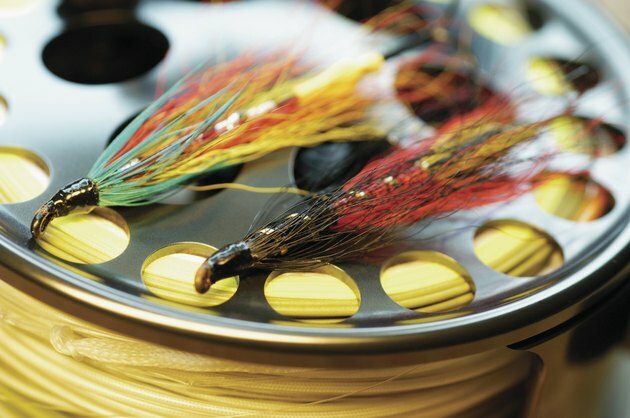 Discover Boating: What is the Best Fishing Bait?